After finishing the Boston marathon in 2015, I became extremely fond of running BIG marathons. The crowd and the atmosphere helped me to push from the start to the finish line. 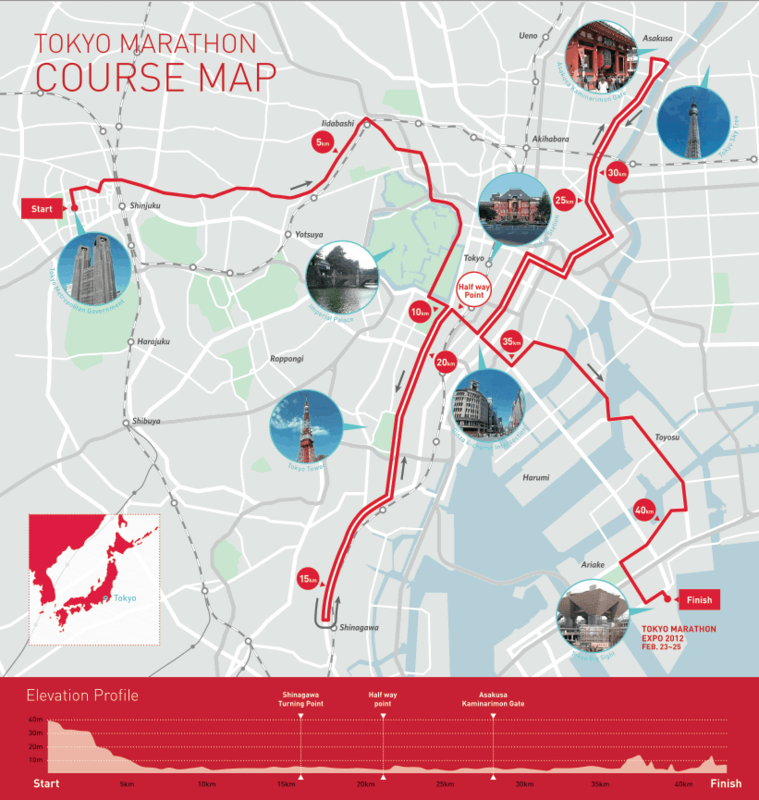 Looking at the World Majors, the Tokyo Marathon would make good sense for travelling afterwards, especially for my little man of almost 3 year old who should appreciate the Tokyo Disney Land and other amusement parks. 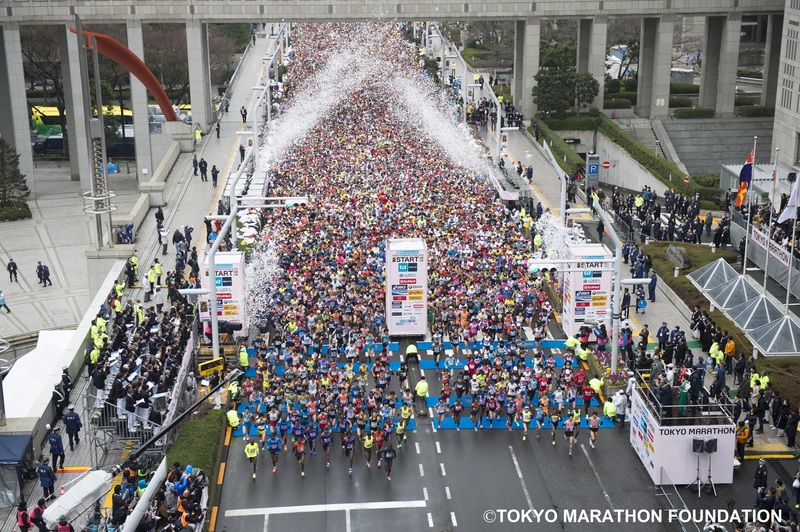 I started browsing the Tokyo Marathon website. It seems bizarre that the organization actually makes a new website for the event each year. So, when I looked early in the year only the 2015 website was available for viewing. Based on what I had gathered, the event is highly competitive to enter. The odds are about 1/10 chance. In the past, about 300,000 + applicants would swamp the site on the first day of registration fighting over 30,000+ spots. For me that sounds like a very slim chance. However, when the 2016 official website was launched, I learned two new information that excited me. The first was that this would be the 10th anniversary. 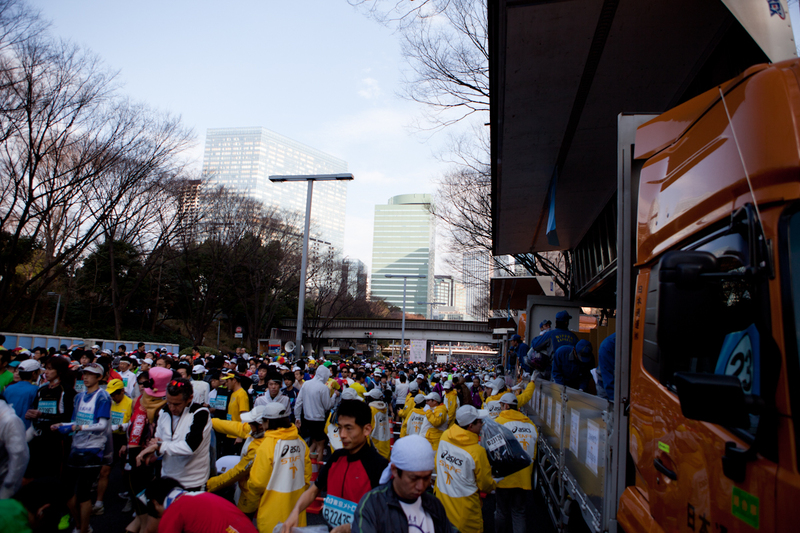 I didn’t realize the Tokyo Marathon is so new that it only began in 2007. The other was that Tokyo will be the 2020 Olympic host city. In light of all these, the marathon organizers hope to promote their event and its country on a global scale. Hence, a new program called “Run as One” was introduced. It’s a program for international semi-elites who recently completed any Gold Labelled races (e.g. Boston, New York, & etc) under the time of 2:55:00 for males and 3:40 for females to apply. The exact number of available spots was not disclosed at the time. Later, I found out that there were about 192 international semi-elites of about equal mixtures of sexes from 36 different countries and about 1000 Japan semi-elites. To make the long story short, I applied and was notified my acceptance after about a month. The organizer claimed that they went through a rigorous selection to choose their candidates. Other than the marathon time/certificate submitted, I really have no idea what other criteria they determined. One of the perks of being a Semi-Elite was that I got to know my acceptance about a month earlier than the general applicants. I absolutely loved this. I booked my tickets and accommodations immediately. ANA airline was offering some great deals so I secured my round- trip air ticket of direct flight from Vancouver, BC to Tokyo for the price only $650 (tax included). Tokyo Marathon Expo was held at the Tokyo Big Sight. It’s similar to a convention centre in any major city. This place was accessible by the Tokyo metro or bus. If you were taking the bus, just make sure you double check with the driver that it actually arrives at the Tokyo Big Sight. Buses of the same # do not necessary end at the same place. So, don’t make the same mistake I made. If you are pressed for time, do take the subway rather than the bus because the road can be very congested. If you wish to see the neighbourhoods along the marathon route, the bus is a good option. The location of the expo is remote so it does take sometime to get there depending on where you begin. 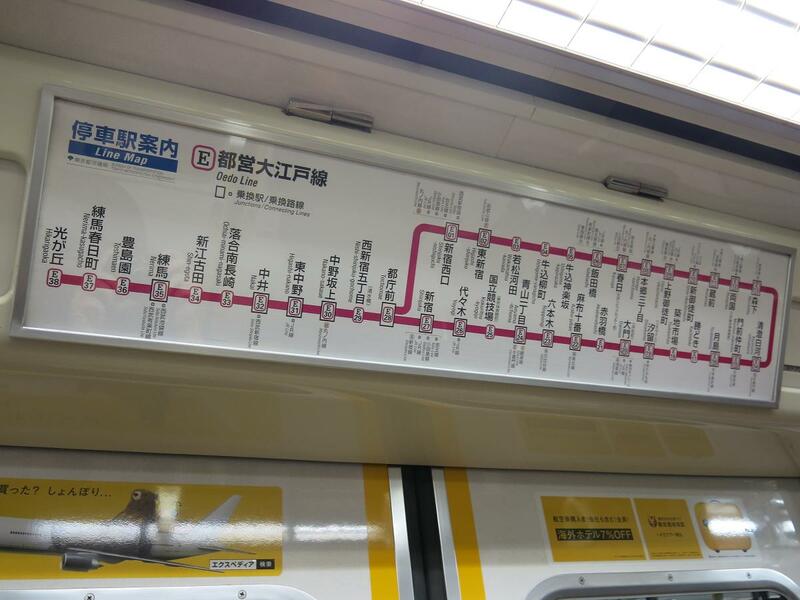 A side note, there are multiple stations including the Tokyo Big Sight that run in a loop by a specific metro line. Within this loop, there are multiple places that are worthwhile for sightseeing. To name a few, there are two shopping centres including an outlet that resembles the Caesar Palace of Las Vegas, the Tokyo TV station; and, of particular interest is the Toyota centre that contains many exhibits that are suitable for all ages. The best thing is that all these places are free ! I don’t recommend doing all these in a day because the expo alone can already consume most of your time and energy. I recommend doing them after the marathon to save your legs. The expo is mostly open to the public. They do have many interesting things to see. The packet pick-up area however is only restricted to runners. I highly commend the marathon organizer for training a huge number of volunteers to be able to speak variety of languages. Because of my Asian look, I was greeted in many languages (e.g. Japanese, Mandarin, and English). I also met two volunteers who spoke fluent French and Spanish! Now for those who are wondering if you’d receive any special treatments as a Semi-Elite, the answer is NO! Other than being accepted earlier, the other perks include receiving a semi elite bib and a semi-elite wrist band to start at the first corral. And no, you don’t get to warm up with the Elites. Also, you don’t get your own bottle at the fluid stations. So, you are pretty much treated the same as the other 30,000+ runners! Actually, to be fair, you do get recognized a little. Your name and country of origin are listed on a wall in the Run as One section. So, don’t miss it! 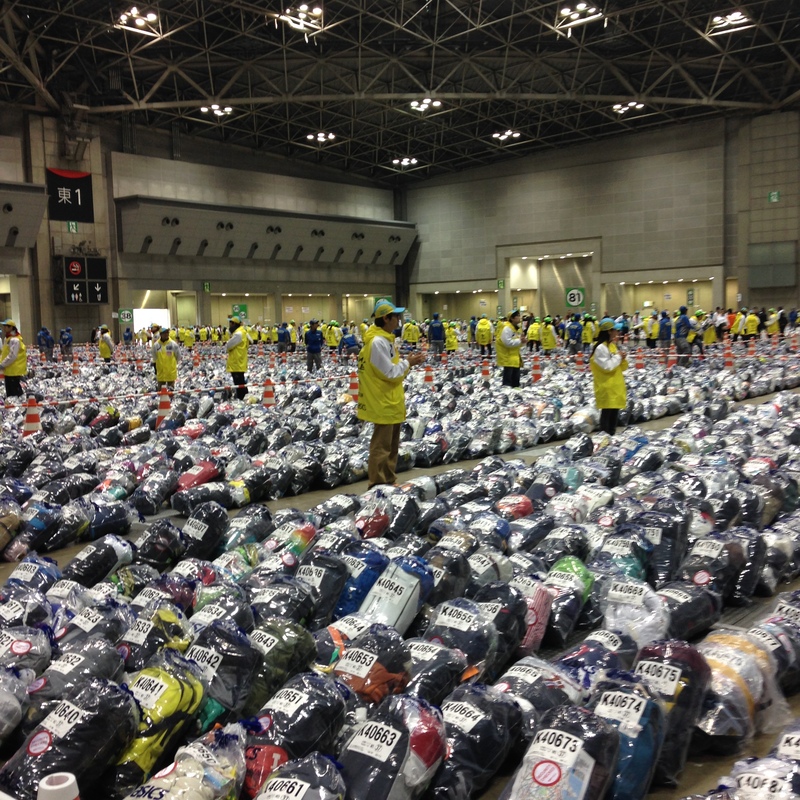 With regards to the packet pick-up process, it was extremely efficient. You won’t be lost because the whole process was guided by one volunteer and followed by another. It took less than 10 minutes. The expo is not as big as I had expected. It’s certainly nothing like the Boston Expo. I’d say it’s probably half the size of it? There are two levels. The upper is all about the race and the other World Major marathons. It’s sort of like an exhibition. 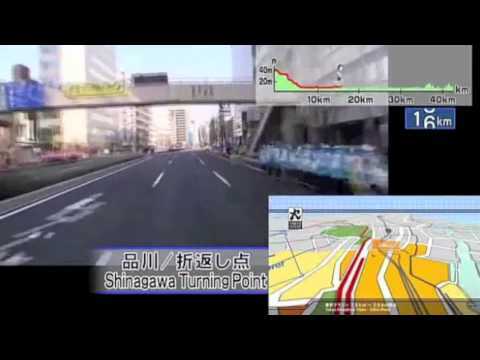 Of particular note, similar to the Boston Marathon, it does display a video in Japanese with a live commentator and one in English of the marathon course. The lower level is similar to any race expo where there are many vendors. This one is interesting because you get to see a lot of Asian running brands. Also, for those who love to collect the official apparels, please make sure you grab them first thing you are there. I was at the expo on the second day . By then, all the jackets (size S and M) were all gone! I don’t really like spending money on these expensive jackets (approx $100 US) which I’d probably never wear for any occasion. The only thing I contemplated buying was the hat with the Tokyo Marathon 2016 logo on it. In the end, I didn’t but spent most of my money on their souvenir store buying the one of a kind Tokyo Marathon 2016 cookie. It had the logo of the marathon and the course map printed on it. I figured I could probably find pretty much anything from Japan in Vancouver, so this is probably the only thing that would be meaningful and unique to bring home. These items went on sale immediately after the marathon! My advice is to go to the expo two days before the race so that you can see everything inside. I stayed at the expo for a good 4 hours. For most races, I always arrive at least 1.5-2 hours prior to the gun time. For this race, it starts at 9:10am I arrived at 7:15 am and felt very rushed!!! If you are like me who doesn’t like to be rushed, my advice is to arrive even earlier than I did. 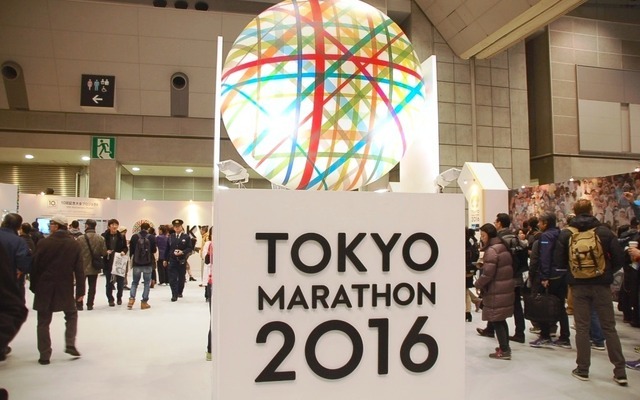 Because of the Boston bombing and the recent Paris attack, the Tokyo marathon’s security is very tight entering the venue. Based on the info on your race bib, you will be informed the GATE entrance closest to your corral. The Runners’ Handbook does suggest which subway station to get off for each gate; however, I did not find the information to be the most accurate. I found most people including myself got off at the Tochomae Station rather than the suggested Shinjuku Station. It was a short walk of less than 10mins. Getting to the race site on Subway was pretty efficient and easy. The train wasn’t packed at all. However, please check the arrival of your train at the platform. Also, plan for an alternate route to get there. For example, I initially planned for a route that would take about 40mins of travel time. However, it turned out that the express train would arrive 30mins later than what I had checked on Google. I immediately switched to Plan B. I ran to another platform and boarded another train of a different route. The race site is surrounded by the Tokyo Metropolitan Government Building. This is probably by far the biggest race site I have ever attended. Everything (e.g. bag check, corral, port-o-let) is far apart. Once arrived to the designated gate, I was subjected to a series of security checks. Once the search was done, a sticker was issued to all the bags I brought along. Note: Everything was put into the official clear plastic bag. After few hundred meters walk, I found myself at the potty line up. It was 730am and I counted there was about 40-50 people in each line. It took about 2-3mins per person so I estimated it’d be at least over an hour for my turn. At this moment I really regretted not going at the Subway where there was only about a 10 people cue. I knew I had to go anyway so it was probably better to stay in line. By the time I was done; it was already 8:40am. The bag check trucks were at least another half a kilometer away. The scary thing was that they stop bag-checking at 845am. So I was frantically running from one place to another. I consider that was pretty much my warm-up. I did however manage to do a few sprints and some drills for about 10 minutes but the 3KM warm up run I initially planned was just impossible. The next thing to do was to find my corral. To my surprise, the race actually starts on the 2nd level. They do check your bib before allowing to enter. If you want a spot right at the front, I do advise getting there as early as possible. However, as soon as the corral closes, there is still a good 20-25 mins wait before the gun goes off. So you’d really need to decide if you want that extra few minutes for warming up or that front spot up there! As soon as the gun went off, things had gotten very chaotic. Runners were pushing and elbowing to surge out of the pack. It’d been understandable if it was a 5K race. To make matter worse, few runners fell face flat beside me and were trampled by others. No one helped them to get up and I was continually pushed forward by the flood of people behind. The first few minutes of the first K was a rough game. It was more like a rugby match than a marathon. I felt that there were numerous turns in this marathon. The worst of all would be the two U-turns as can be seen on the course map below. And of course, the two hills positioned at about 37th and 40th KM of the race. Otherwise the race is pretty much a moderate long incline one way and coming back a moderate long decline on the opposite side of the street. Tokyo is also a very windy city, so be prepared for hitting the wind both ways. Looking at the course map and the elevation chart below, please be aware the initial drop from start isn’t as drastic as it appears. It is certainly nothing like the first 10K at the Boston Marathon. In terms of weather, the climate for race day was perfect for most runners. The race started out at 13C and at around noon it was about 18C. The wind was about 20-30km/h. I normally appreciate a much cooler weather of about 5-7C but I won’t complain. The aid station is plentiful. The set up is as follows: 1) multiple tables for elites 2) few hundreds meters apart 3) multiple tables of Japanese brand energy drink 4) multiple tables of water 5) few hundreds meters 6) The same set up happens again on the other side of the road. 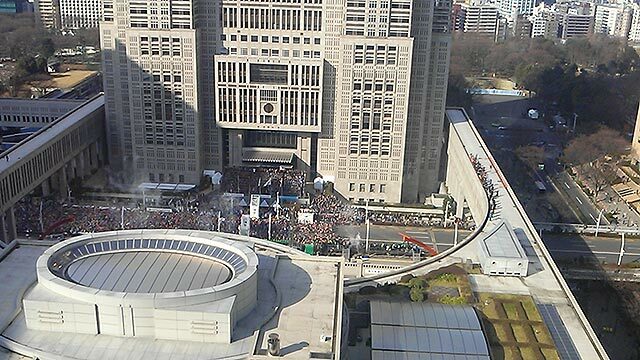 The finish of the Tokyo marathon is in stark contrast to its start. It is situated in a remote industrial area where no friends or family members have access to. Your last 100 meters sprint or crawl will only be cheered by the race officials or volunteers standing at the end. Once you crossed the finish line, you will be handed your finisher medal. After that it’s about a 1K walk to the after-run venue, once inside you will first claim your bag and followed a variety of options – foot spa, acupuncture, massage, change area, food (e.g. tomato), Asashi beer, photo booth and Seiko customized official time poster. I experienced pretty much everything. The foot spa uses hot spring water and claims to have an therapeutic effect for recovery. For us with a more western mindset, an ice-bath would probably be the best post-race for inflammations. The massage is not really a massage. It is more like moving your legs in all sorts of directions to elicit stretching effect. It did however aggravate my quads and hamstrings into a full cramp! Yikes! Most races in the North America would hand out bananas as their post-race food; here, they handed out tomato and Asashi beer! I think it was because these companies were part of the sponsors and really had nothing to do with their culture or tradition. After all these, I walked for about 15-20mins before arriving the family meeting area. The race went by quickly! I had a lot of expectations getting into this race, which was highly praised by many runners. To be honest, it was an excellent race but didn’t live up to all the hypes. May be I am comparing this to the Boston Marathon I had in 2015. The day I ran Boston it was at its poorest condition (e.g. 50K+ wind, freezing rain, 4c chilly weather) but despite all these the crowd support was still way stronger than the Tokyo. For both races which are on an international scale the sportsmanship among the runners differed drastically. This is probably only true based on my first hand experience which could be entirely subjective. I was in the first wave in both races, meaning people around me were very competitive. In the Boston race, I was never elbowed nor touched by anyone. We ran our own race but also supported one another all the way to the finish. On the contrary, the Tokyo race was like a battle royale. As described above, the first K was a gong show. It was a showcase of complete lack of sportsmanship in the first wave, especially for the local elite runners. The local volunteers were the best though! I was pushed and punched intentionally by another local elite runner towards the finish of the race. I had a good control of my muscle of not seizing up up until that point where I had lost my balance because of the sudden surge. Checking into the latest website, the organizer made a huge change! The course is changed! It’s great because it ends in a very central area! It’s bad because they’ve added more turns and u-turns. 2) If your friends or family members will meet you after the race, please expect a very long line up for security check. Also, the subway is chaotic on the day. Please advise your friend/family to budget at least an extra 1.5-2h for travelling. 3) The placement of the hills come at about 37th and 40th KM. If I were to do this race again, I’d consider about running a faster first half. 4) There is no WIFI in the family meeting area. My suggestion is to stay at the baggage pick up area as long as possible if you need FREE internet connection! 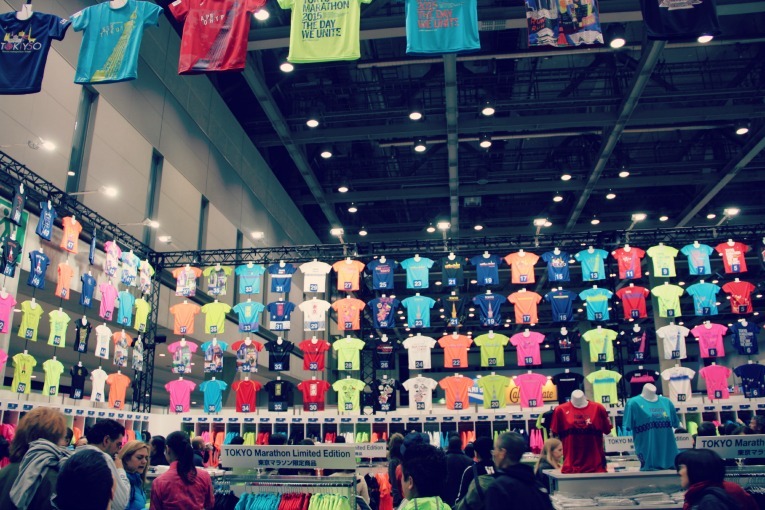 5) Everything in the marathon souvenir store goes on sale immediately after the marathon.